Watch out for not just what gets captured in a CCTV video footage, but also what the CCTV network itself is powered with; especially when it comes to cabling. The more advanced the cabling is, the more efficient will the surveillance be. That is why you will never need to think twice before going with the country's most trusted brand-Plaza. Living up to the needs of the time, Plaza has arrived with a specially designed cable for CCTV video and audio transmission. These are far more superior to normal coaxial cables as they are designed to transmit the complete video frequency range with minimum distortion or attenuation. Earmarked for precision and standardization in endurance for secure surveillance and DVR outputs, Plaza is undoubtedly the industry leader when it comes to CCTV cables in the country. An interior designer has rightly quoted the following words-"A large amount of quality parameters have to be considered while choosing a brand for CCTV networking across multi-level parking and shopping areas. We have been using Plaza CCTV Cables for the same and without doubt, they have proved to have an edge over other products during our trial phases. Plaza effectively resists rodent attacks and over heating or seepage within the mounted boundaries and being weather-proof, lasts much longer". No wonder that a large number of security agencies prefer Plaza CCTV cables for efficacious security matters. Banks, offices, retail spaces, commercial complexes-wherever surveillance matters, Plaza comes to the fore. 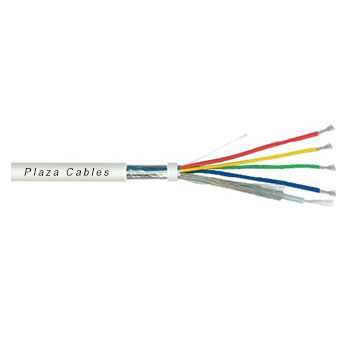 The reliability quotient about Plaza is so high that even research and patrolling divisions of various Government and autonomous departments use Plaza Coaxial cables. Why say more? Packing : Available in 100 meter packed in carton and 305 meter packed in easy pull box. Screen: Annealed tin coated copper 85% coverage approx.